Swirly Designs by Lianne & Paul: Do you have a doodle book? Do you have a doodle book? Ever since our our days in art school Lianne and I were encouraged to always keep a sketchbook with us at all times and make it a habit of sketching in the book everyday. 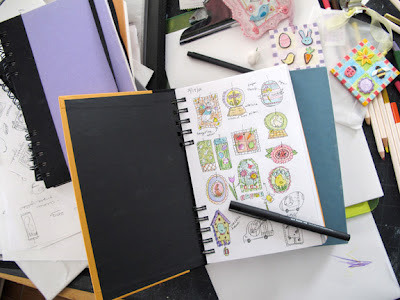 Well, it's been along time since our days of art school and many of the sketchbooks were tossed away, placed high on the book shelf or just became quick sketches on paper and discarded after the project was complete. It wasn't until we started designing our ornaments that the sketchbook ritual returned and become such a vital part of the designing process again and our designs. 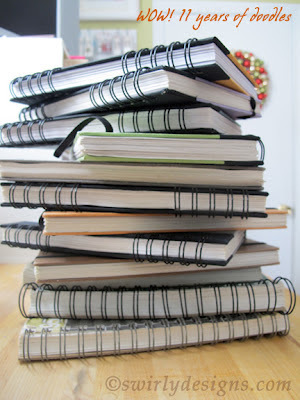 Nowadays we can't think of not having one the sketchbook. 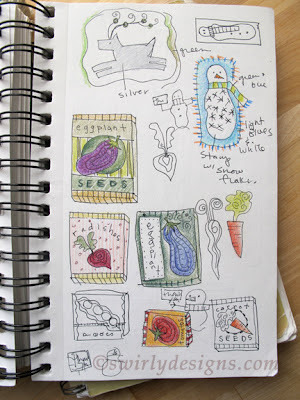 These days it is not as easy for Lianne to always keep up with a sketchbook, but she definitely tries. I try to take it everywhere... to family events, appointments, even jury duty. 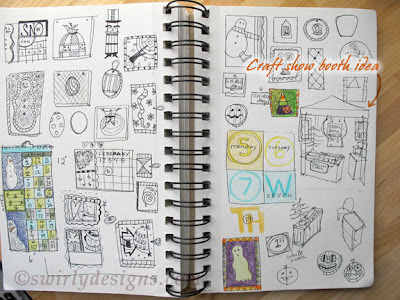 I highly recommend everyone keep a "doodle" book in one form or another. It's such a great way to express your creative ideas and becomes a great reference and inspiring guide. 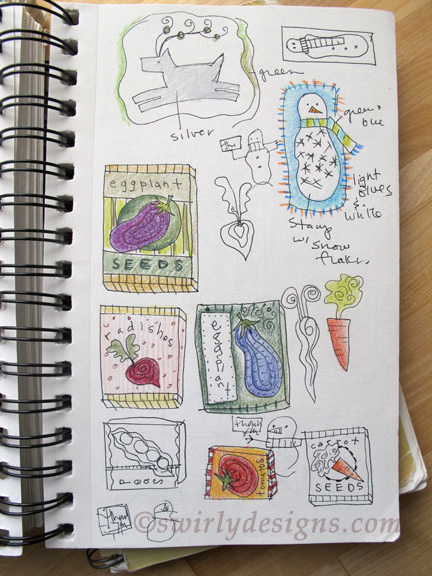 This weekend I started my 12th sketchbook (it usually take me a year to fill one up). After adding the 11th book to the shelf I thought I would visit some of the pages from the past eleven years. 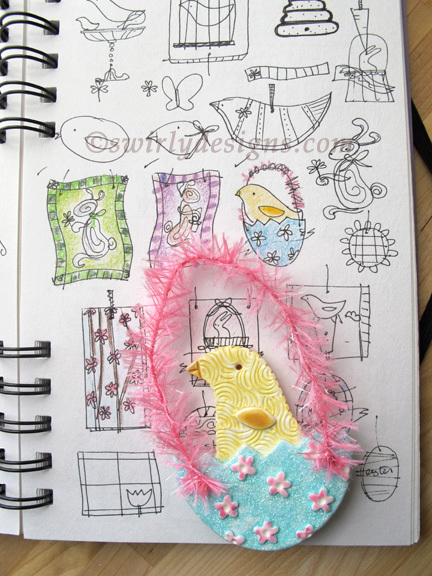 Kicking off the 12th book, are the start of the sketches from our new Easter/Spring collection. 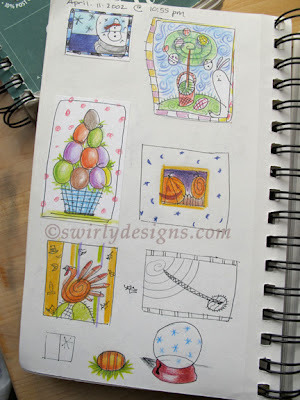 The sketch books I prefer are called Cachet Studio. They're available in wonderful colors and sizes. I've been using them for years and really enjoy them. I love the 5 x 8 size because I prefer to sketch smaller and it makes a great travel companion where as Lianne enjoys the bigger size to sketch in. I try to make sure I record each and every thought.... the good and the bad. This page was the start of the design process for our Swirly Designs name. 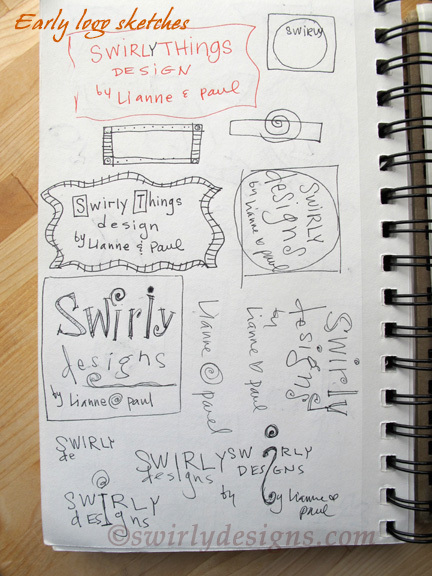 At one point, we were considering the name Swirly Things Designs for a while. Yikes! 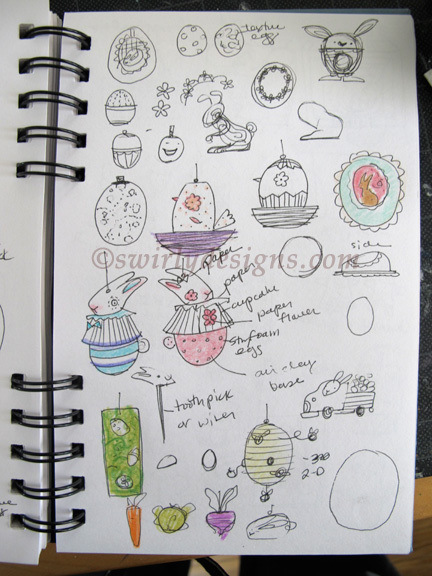 I also like to add notes and color to some of the sketches to help fine tune some of the possible designs. 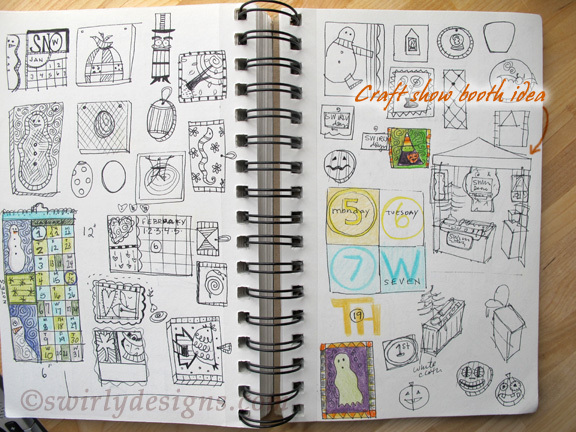 At one point we were tossing around the idea of creating a Swirly Designs calendar and on the right side was a sketch of an early craft show booth layout. I'll randomly add the date and even sometimes the time on the top of the page. Why... I don't know. Sometime it fun to look back and see when and what time the ideas were created. Above, shows our now six year old's 1st birthday invite illustration and sketches. 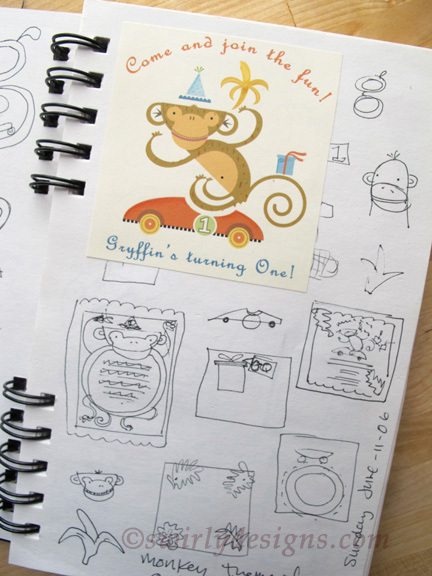 and from sketch to final product, it's always fun to see the design process come alive. So we encourage you all to go and pick up a sketch book and start DOODLING your creative life! I Love the whole process thanks for sharing! I am a doodler myself the book is a great idea instead of having little papers everywhere of my favorite doodles that I can hardly bear to part with! Just found you over at Pinterest. What a great blog...I'm following now and love everything I've seen and read...you're just too adorable!! We are Lianne & Paul Stoddard the artist and creators behind Swirly Designs where our passion for decorating for the holidays inspired us to combine our artistic skills to create our own collection of original handmade polymer clay holiday ornaments. Be Green and make your own LORAX! Yankee Magazine "New England's Finest"
All How to/process content on this site is for your personal, noncommercial use ONLY.